Driving along the M74 into Glasgow on a glorious autumn morning, the ‘Is your car ready for winter’ message on the overhead signs seemed somewhat premature. However, the destination was the landmark Riverside Museum where Transport Minister, Derek Mackay MSP, was launching Scotland’s winter road maintenance programme alongside a display of some of the hardware available to combat the extremes of the season’s weather. The overhead signs form part of Police Scotland’s support for the programme and will be accompanied by an information section on their website. 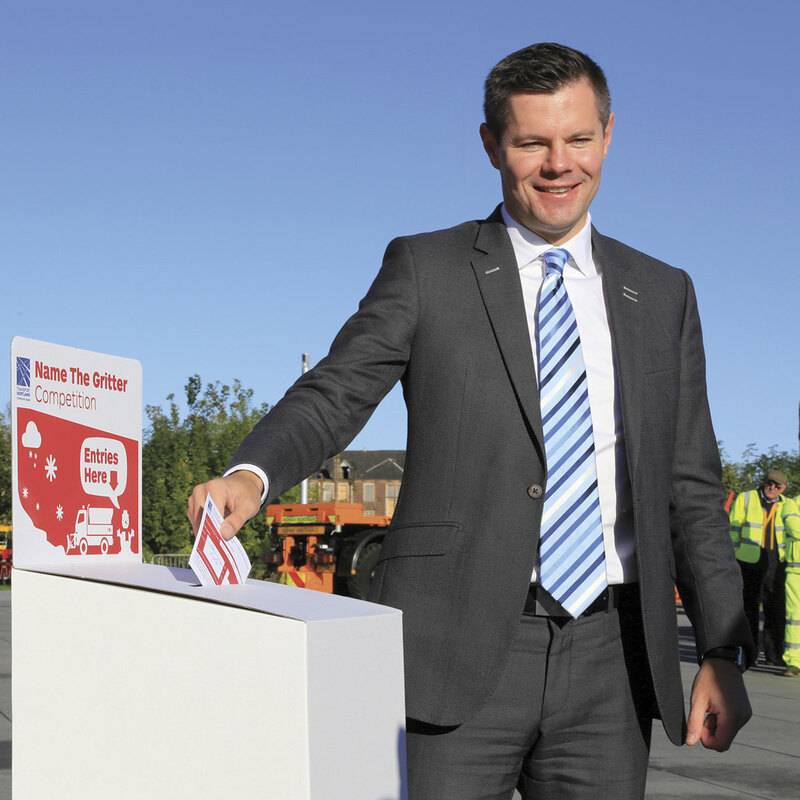 Transport Minister, Derek Mackay MSP, puts the first entry into the ‘name the gritter’ competition. For maintenance purposes, Scotland’s trunk road and motorway network is divided into four unit contracts that are currently held by Amey (South East), BEAR Scotland (North East and North West) and Scotland TranServ (South West). Between them, they have 205 winter service vehicles available and call on the services of around 400 operatives at 42 locations. They expect to use approaching 100,000 tonnes of salt over the winter period. In the past year, 57 new gritting trucks have been added to the Scottish fleet, over half of them larger than previous vehicles. Two examples of these 8×4 gritters were on display outside the Riverside Museum, a Mercedes-Benz Actros 3243 from BEAR Scotland and a DAF 85.360 from Scotland TranServ. Both were fitted with snowploughs and designed for pre-wetted salting. In this process, they deliver a mixture of brine and salt that sticks to the road surface, a more effective and faster acting treatment than salt alone. Scotland TranServ’s Unimog based snowblower. 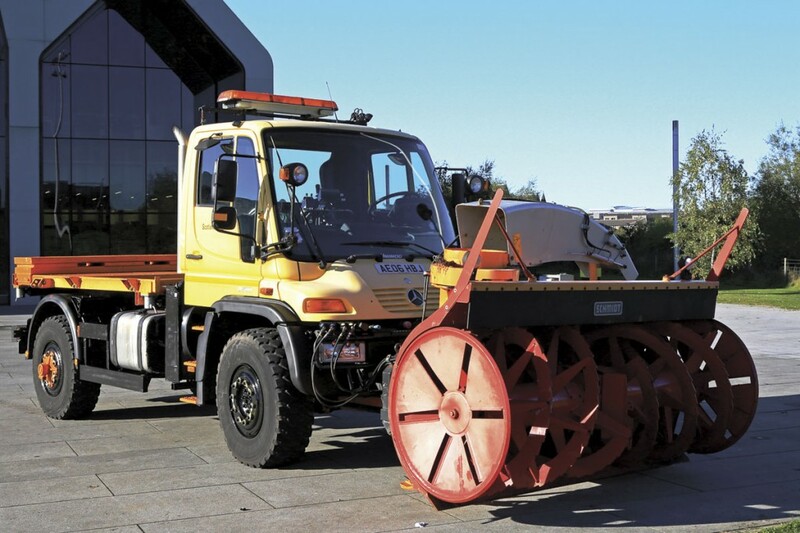 Scotland TranServ also had a Mercedes-Benz Unimog based snow blower available for inspection. This was one of a number of dual purpose Unimogs and JCB Fastracs which are used for vegetation control in the summer months then fitted with a snow broom and blower to move accumulations of snow away from the carriageway, moving up to 600 tonnes per hour. For very heavy duty applications, BEAR Scotland advised that they also have a military style MAN 6×6 vehicle available. The two gritters were to remain on show at the Museum for the school half term week where they formed the centrepiece of an awareness campaign aimed at increasing children’s knowledge of road safety and the science behind the winter weather programme. In support of this, one of the gritters carried a large banner with facts and figures whilst a competition was launched to name the two vehicles. The winners will be invited to an appropriate depot and see their chosen name displayed on the vehicle. The gritting vehicles are also equipped with emergency kits to support the occupants of any vehicle that may become stuck, including blankets and water. In the northern half of the country, BEAR Scotland will have 20 patrol vehicles in operation nightly from 1 November to 31 March, five of them devoted to the A9 between Perth and Inverness. As well as salting where required, these vehicles will record real time information on road surface temperatures. Alongside the four contracts which cover the motorway and trunk road network, including the M90 bus lanes, individual local authorities have plans in place to handle winter conditions on the other roads in their areas.